With the career and work centereed expansions, it is time for the Sims to take a vacation, and luckily Outdoor Retreat offers just that. With a focus around camping, fishing, and collecting there is a lot of content in this game pack, although it may be the weakest game pack available. 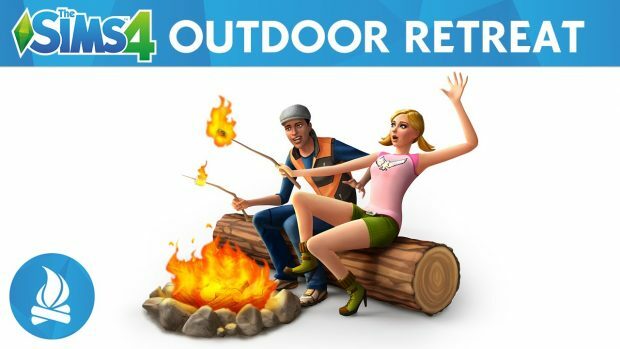 If you have been looking for a camping adventure then The Sims 4 Outdoor Retreat is a great place to start. I had a blast for my first few hours exploring the forest, fishing, and meeting new Sims. The new area introduced in Outdoor Retreat is Granite Falls and it is a fun, unique, and overall well polished Sims town. It features campgrounds, cabins of different luxuries, and a deep forest to explore. My only real complaint was the fact that you cannot buy any of the lots to build a home, and permanently live in Granite Falls. To get there you have to click on your phone and schedule a vacation, up to seven days, and then select where you want to stay. The campgrounds and cabins all have daily rates you need to pay. On top of that you need to buy a tent and supplies if you are camping and that can get costly. Starting a new Sim for this review forced me to spend my first hour working just to get enough money to buy supplies and pay for my vacation. I feel like everything should be a little cheaper for when you are “roughing” it, and was disappointed I had to work or use cheat codes to be able to enjoy this game pack. Also included is a new skill, herbalism. Relying on the ten new herbs and bugs from the Outdoor Retreat pack your Sims are able to craft potions and items like weed repellent, fertilizer, and bug bite ointment. You can also create mixtures that have effects on your Sims’ emotions. Also included is the outdoor enthusiast aspiration. Doing things such as collecting insects, catching fish, harvesting herbs, and other outdoor activities allows you to work towards your Sims aspiration, ultimately leading to the reward trait Survivalist, which makes your Sim happier while camping and being outdoors. There are also plenty of new activities for your Sim to complete. From roasting hotdogs, to telling ghost stories around the campfire, the activities included are all made for outdoor adventures. It was nice to end a day of fishing by gathering with friends around a campfire and hanging out and playing guitar. Although the activities add some more elements to the game I also felt they are not different enough to really stand out. This is a common element throughout the whole game pack; it adds a little more to do, but ultimately doesn’t add enough new and unique content. Even with outdoor themed recipes, such as franks and beans, or woodworking schematics, I felt like I had seen most of the expansion within a couple hours and nothing drove me to keep going in Granite Falls. One thing Outdoor Retreat did well was the new items. With over 60 new objects to use in your Sim world, it rivals even the biggest stuff packs. Many items are also available to be carried around in the inventory so you can drop things like tents, campfires, and coolers wherever you want to camp. The amount of objects was exciting and allowed me to camp out how I wanted too. Even if camping is not your forte, there are plenty of cool items available for your Sims’ homes. Outdoor themed clothes, furniture and lighting, and foliage are all available. I loved being able to build a room in my house with a forest theme. The Sims 4 Outdoor Retreats biggest problem however is there is just not enough. Going on a vacation once in awhile proved to be briefly entertaining, but with most of the game pack revolving around that it fails to bring much into the main portion of the game. If you are wanting to get outdoors with your Sims this is a great little pack to give them a vacation, but don’t expect much more than that. The Sims 4 Outdoor Retreat has fun new items, a unique aspirations, and new activities. It is nice to bring your virtual people to the outdoors but fails to give longevity outside of a brief vacation.